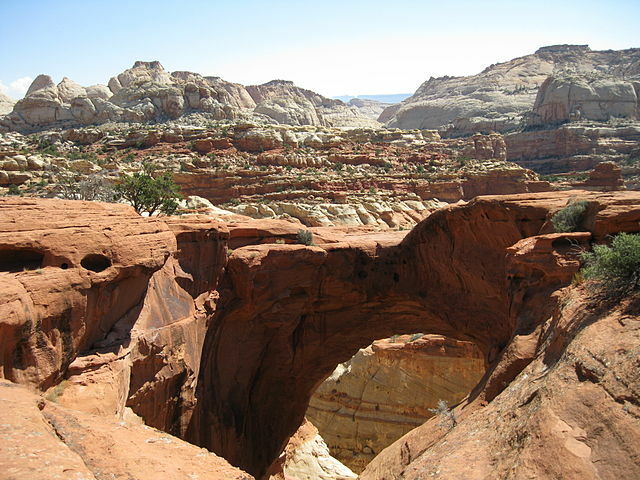 The Waterpocket Fold defines Capitol Reef National Park. A nearly 100-mile long warp in the Earth’s crust, the Waterpocket Fold is a classic monocline: a regional fold with one very steep side in an area of otherwise nearly horizontal layers. A monocline is a “step-up” in the rock layers. The Waterpocket Fold defines Capitol Reef National Park. A nearly 100-mile long warp in the Earth’s crust, the Waterpocket Fold is a classic monocline: a regional fold with one very steep side in an area of otherwise nearly horizontal layers. A monocline is a “step-up” in the rock layers. The rock layers on the west side of the Waterpocket Fold have been lifted more than 7000 feet higher than the layers on the east. Major folds are almost always associated with underlying faults. The Waterpocket Fold formed between 50 and 70 million years ago when a major mountain building event in western North America, the Laramide Orogeny, reactivated an ancient buried fault. When the fault moved, the overlying rock layers were draped above the fault and formed a monocline. Only a few decades ago, Capitol Reef and the Waterpocket Fold country comprised one of the remote corners of the lower 48 states. Easy road access came only with the construction of a paved Utah Highway 24 through the Fremont River Canyon in 1962. 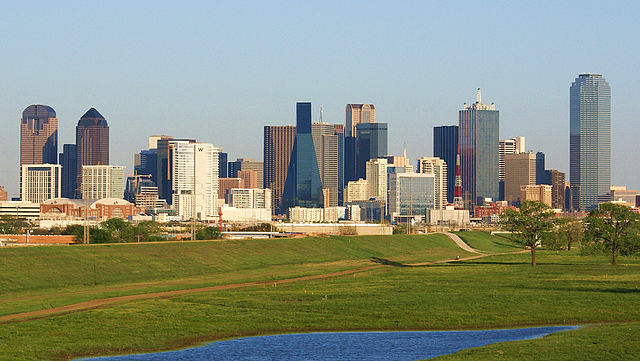 The earliest traces of human activity date from the 9th century when Native American Indian peoples occupied the flood plains and high ground near the few perennial watercourses. These people, called the Fremont Culture by archeologists, were contemporaries of the Ancestral Puebloans of the Four Corners area. Between 1250 and 1500, evidence of the Fremont Culture becomes rare and gradually ceased to exist. A complex combination of environmental and social pressures may have led to this change, but no definitive explanation has been found. Not for several centuries did significant human activity reappear. When the first white explorers traveled in the vicinity of the Waterpocket Fold, both Ute and Southern Paiute nomads were encountered. Despite the fact that numerous expeditions passed near Capitol Reef, none of them explored the Waterpocket Fold to any great extent. John Charles Fremont passed through the Cathedral Valley in 1854, finding the region, as it is now, incredibly rugged and forbidding. Following the Civil War, Mormon church officials at Salt Lake City sought to establish missions in the remotest niches of the intermountain west. In 1866, a quasi-military expedition or Mormons in pursuit of Native American Indians penetrated the high valleys to the west. In the 1870s, settlers moved into these valleys, eventually establishing Loa, Fremont, Lyman, Bicknell, and Torrey. Meanwhile, men from the expeditions of Major John Wesley Powell had begun to explore the area. 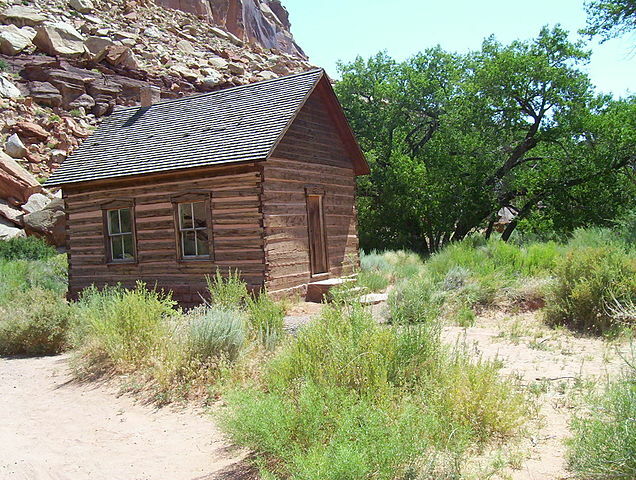 In the early 1880s, settlers moved into Capitol Reef country. Tiny communities sprung up along the life-sustaining Fremont River; Junction (later renamed Fruita), Caineville and Aldridge were created. Fruita prospered; Caineville barely survived; Aldridge died. By 1920, the work was hard but the life in Fruita was good. No more than ten families at one time were sustained by the fertile flood plain of the Fremont River and the land changed ownership over the years. The area remained isolated.